The postcard issued in 1936 to commemorate Sliema Wanderers` league title in 1935-36. 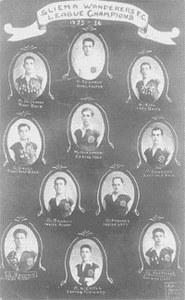 Back in 1935-36, the Malta FA divided the First Division teams into two sections. Section A was made up of Floriana FC, Sliema Wanderers and Hibernians FC and Section B featured Sliema Rangers, the Tigers and Qormi St George's. The competition could not have had a more intriguing start with rivals Floriana and Sliema Wanderers drawing swords in front of one of the biggest ever crowds at the Empire Stadium. Days before the big game, all the reserve seats were sold out and tickets for the enclosure were being offered on the black market for five shillings and even seven shillings. One must keep in mind that this was more than the average weekly wage at the time. The ticket office opened at 10 a.m. on the Tuesday before the match but after just two hours of rough handling, when one had to fight one's way through the crowd, the tickets were sold out. For the first time ever, at least as far as I could ascertain, the match was broadcast on Rediffusion network. Mr Gatt Rutter, the president of the MFA, was the commentator. For all the expectation, the match was an anti-climax. In fact, it was never completed. The great occasion was spoilt by the soft and slippery pitch. The teams would surely have preferred to play on a hard ground and a fast ball with which to fully express their enthusiasm and get to grips with each other. As a consequence, entertaining football was non-existent. Passing movements and first-time football, so enjoyed by the crowds in those days, were impossible to attain because of the heavy ball. To make matters worse, the match was abandoned when, with the score 1-1, Floriana scored a disputed goal. Pawlu Friggieri shot on the turn and the ball dropped over the bye-line. The ball might, or might not, have hit Gauci before going over but the referee awarded a corner. Leli Cauchi took the kick immediately and Friggieri headed in. The Wanderers gathered around the referee in protest, urging him to consult his linesman. The referee refused to heed their calls and as the Wanderers persisted with their objections, he abandoned the match. Floriana were awarded the points but the incident provoked a lot of controversy and added fuel to an already blazing bonfire. The league continued with all its rivalry and excitement on Sunday January 12, when Hibs faced Sliema Wanderers. The Blues were rather lucky to get away with a 2-1 victory. The winning goal was scored very late in the game when a draw seemed imminent. The match between Floriana and Hibernians, that brought to an end the first round, developed into a great battle between Hibs' formidable defence and Floriana's talented forward line. It was marred however by two injuries to Floriana's Friggieri and Alexander Svoboda, of Hibs. At the end, both teams were happy to share the spoils as the game ended in a 1-1 draw. And so the stage was set for the deciding match between Sliema and Floriana, scheduled for Sunday, the ninth of February. Once again the build-up for the game was tremendous. Hours before kick-off, all roads leading to the Stadium were jammed with traffic. Floriana had Friggieri missing, but the Greens' supporters were shocked to see that Leo Drucker was absent as well. This caused a sensation. The match was keen and exciting, brimming with fast-flowing football. Floriana pressed for an early goal but slowly the Blues started to find their feet and not before long, Robbie DeCesare opened the score from a free-kick. The second half had barely begun when Formosa made it 2-0 for the Wanderers. This goal spurred Floriana who surged forward in a desperate attempt to save the game but Sliema's defence held firm until the end. After the match, the angry Floriana supporters demanded to know the truth about Drucker's defection, leading to both parties issuing statements to clarify their positions. Drucker explained that a week before the match, he had fallen ill and was subsequently advised by Professor P.P. Debono to stay in bed for a fortnight. The version of the Floriana committee was different. They claimed to know nothing about Drucker's illness and it was only minutes before the players' departure to the Stadium that they were informed of his withdrawal from the match. Whatever the truth, this episode marked the beginning of a rift between Drucker and the club and, at the end of the season, both parties agreed to part company. After the Sliema-Floriana game, both teams still had to play Hibernians but Sliema had by now taken a one-point advantage which they kept till the end. The Wanderers went on to beat Hibernians 5-0 and seal the championship.